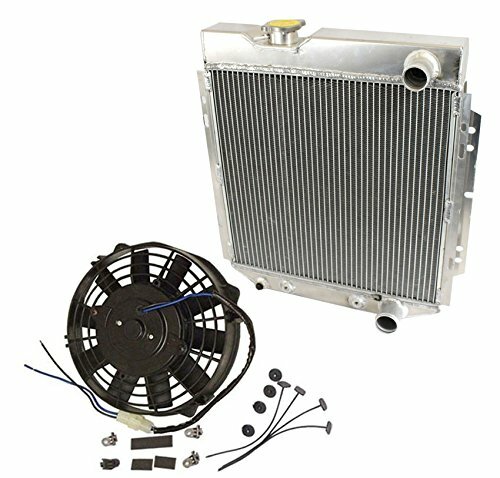 This Aluminum Radiator is designed to provide maximum cooling efficiency to prevent premature engine failure. Its light-weight, and high-heat transferring aluminum features a tube and fin design that, dramatically increases surface area that enables the heat to dissipate more efficiently. This Aluminum Radiator is at least 40% more efficient than stock ones. Most importantly, it has a much higher capacity for coolant than stock ones, which means that your cooling system will be more efficient and will be more resistant to temperature surges in racing applications. Overall Size: 18.75" x 21.25" x 3.00"
Core Size: 17.00" x 16.50" x 2.50"
Improves cooling by 35 - 45% Temp. --100% Brand New Electric 14" Straight blade reversible cooling fan measuring approximately 14" x 14.75" x 3". --This 12 volt fan has an output of approximately 1900 CFM. --Ideal for OEM or high performance applications. and would be a quality addition to any vehicle. Radiator Overall Size: 18.75" x 21.25" x 3.00" , Core Size: 17.00" x 16.50" x 2.50"
View More In Radiator Conditioners & Protectants.